Call me pretentious, effete intellectual, but I deplore the absence of a comparable figure with a narrative close to that of Ed Ball‘s in the Moroccan political discourse: the bare-knuckled, assertive, even aggressive economic message pounded away at the media, the established government and those who tend to disparage the left-wingers as either bleeding-heart liberal unable to go beyond the nice but vague rethoric and principles, or corrupt career politicians driven with an insatiable hunger for power and wealth. The late 1950s were about gaining economic independence: big government was needed to monitor and smooth the transition from a French-controlled economy to a more ‘national’, domestic economy. Abderrahim Bouabid, during his tenure as Finances Minister and then Vice-Head of Cabinet (with Premiers M’barek Bekkaï, Ahmed Balafrej and Abdellah Ibrahim) produced what could well be the most prolific executive legislation, ranging from creation of Dirham Currency to that of the future Bank Al Maghrib Central Bank, and various institutions, among others the modern Office des Changes to monitor flows of foreign capital, and make sure the financial instruments needed to carry out monetary policy are mastered and under domestic control. That gilded age of the Left of sorts needs to be restored, not with the same means, but with the same spirit, in resolution and assertiveness. Big government, strangely enough, is favoured both by the Left (extending as far as Annahj far-left) and Makhzen traditionalists: a strong centre is needed to insure one or the other’s political and economic agenda is well executed. The core difference in their economics matters very little at the end: whether concentrated with a small nucleus of wealthy individuals (the Right and the ongoing pursued policy higher up are keen on supply-side economics) or a core of activists-bureaucrats (The left) there is very little difference but in the quality of the oligarchy. Half a century of centralized decision-making and, even worse, centralized way of thinking has made public services in Morocco accountable to no one, with ordinary, median/average citizens at the receiving end of both administrative carelessness and more concentrated income distribution (in 1985, Gini Income Index was 0.36; in 2010, it was 0.46) So the justification by the Left of big government and burdensome regulations is void: it did not prevent private monopolies and special interests from taking a slice of the national cake, an increasing slice on top of it, guaranteed and protected by regulations and legislation. Perhaps the Moroccan Left and Liberals need to accommodate burdensome and embarrassing allies: the corrupt and shady Unions, the powerful corporatist interests they support and count on (Lawyers, for one) and finally the once-loyal support of lower echelon in the Civil Service. The problem with such coalition is that it lacks the actual strength -never mind the consistency- to impose its supposedly progressive agenda; Regarding unions, their massive and disruptive potential has waned and they can no longer muster enough resources to stage demonstrations, let alone force deals for everyone to benefit from. The same goes for the special interest groups, strong enough to block attempts to force the status-quo, but too weak and divided to formulate and impose clear a coherent set of policies. 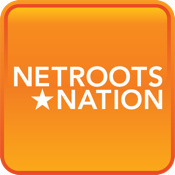 A coalition needs to be built around the ideals of progress, economic advancement and social justice – in that order. I cannot claim to produce reliable surveys on that topic, but it seems to me that fellow Moroccans I happen to engage with in discussions still view Socialism (that word really has gone out of fashion, hasn’t it?) and its economic policies as mainly Social, i.e. subsidizing the poor and soothing social resentment from inequalities; In other words, my non-representative sample does not believe Socialism can deliver on the economy: high growth, good jobs and high standards of living. I argue it can, but with unorthodox means. That coalition – Unions, Corporatist Interests and the weakened Middle Classes– is the key to the new progressive economic policies. Food And Balance Of Trade: Imports of Wheat in Morocco amounted in 2010 to MAD 11.85Bn i.e. about 7.5% of Trade Balance deficit. The value per Imported Tone for Wheat is MAD 2.15 per Kg. More importantly, it has also imported MAD 93.6 Mln in various types of flour, We do import some fish flour; around 3 Tons – For all Morocco. And we export 4kgs (filed under FARINE,POUDRE EN PELLETS DE POISSON PR ALIMENTATION HUMAINE). That’s both laughable and symptomatic of a misguided choice of resources allocations. Why is FPC a good protein source? First, of course, because it is concentrated; untreated and unprocessed foods do not generally contain more than about 20 percent protein, whereas FPC contains about 80 per cent. Secondly, the quality of the protein is high; by this is meant that the amino acids which make up the protein are present in just the right balance for human nutrition. Other foods such as cereals may contain useful amounts of protein but are frequently deficient in one or more of the amino acids that are essential for growth. And there goes a policy that can win favour with a lot of people: all consumers will welcome a new class of flour that would enhance their consumption and increase their standard of living, producers and fisheries would expand their business to meet the demand, and prices of poultry, beef and lamb would decrease too. The one question remains: does Morocco have enough resources to meet the demand of 32 Mln hungry Moroccans? According to the Russian Soy-Bean Company “Russoya” , The ratio for production is around 1/6, meaning there is a need for 6 Tons of raw fish to produce 1 Ton of pure fish flour. Morocco exports 222,000 Tons of Fishery at a unitary price value of MAD 29 per exported kilogram. If it switches to integral fish flour, it can produce 37,000 Tons at a unitary price of MAD 75 per exported kilogram, or even match up to 126 kg per imported kilogram. This is a win-win policy: in trade, Morocco saves up on differential traded value (on terms of trade) in domestic consumption, it increases protein consumption to higher levels, and in business, it allows for thriving companies to fish, condition and sell the product. The 2001 HCP survey on household consumption points out that flour makes up for 55% of all wheat household consumption – and that percentage goes higher with the lower-income deciles: the poorer a household, the higher its consumption of flour – 70% for the bottom 20%. By the same findings, poorer households have a lower meat/protein consumption: there is a 1:64 ratio between the bottom and top 20% in terms of protein consumption. Perhaps the wisest and most straightforward policy to increase protein consumption across the board is simply to stop subsidizing wheat flour, and instead improve storage and distribution facilities for Fish flour. The trade-off is such that any anticipated costs for increasing production capacities -for domestic resources- would still be outweighed by the compensation fund allocation to wheat flour -an international commodity with volatile prices. The rest is history: improving nutrition improves workforce, productivity, growth and leads to an increase in standards of living. 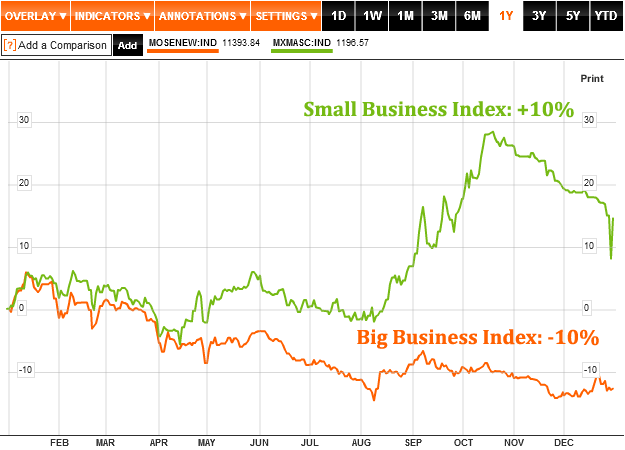 Small Business vs Big Business: I tried in a post earlier this year to explain that smaller businesses tend to do better in valuation and results. We need to do away with the myth of “National Champions” because they only contribute to accumulate wealth with little or no real investment in the economy. Smaller businesses on the other hand, take risks and try to make something real with positive impact on communities and individuals. The admission that capitalism is good does not preclude the reservation on the current economic structure of Moroccan business, which is neither capitalism nor beneficial to the many – only to the very few. MASI index -dominated by juggernauts- systematically did worse when compared to smaller cap-based indexes this year. Still and all, access to liquidity is heavily skewed towards large businesses; credit rationing, with its adverse effects, turns out to harm smaller and riskier businesses, not because of their inherent risk, but because all liquidity has been captured by failing, larger companies. Regulations as well as dangerous acquaintances between businesses and banks makes access to liquidity discriminatory. Parallel to an overhaul in credit allocation, there is a need to take on private monopolies and oligopolies: these harm collective welfare and destroy utility in the process: in Telecommunications, Edible food and other sectors, consumers pay more than they should in a more competitive market. Taking on business special interests means breaking up monopolies and concentrated holdings: SNI (formerly ONA-SNI), for instance goes too far in extending its hold on various business, ranging from Air Travel, Milk and Derivatives, Edible Oils, to the Banking industry. It is only populist in naming and shaming particular businesses, but the positive effects of a less concentrated and more competitive market setting will undoubtedly benefit everyone, from unions to end-users. Agriculture, Taxation with Representation: tax exemption on agricultural products denotes of an obsolete, neoclassical mind-setting, if not outright narrow political calculations to keep off some lucrative rents going on. Taxation, contrary to a belief only too often held by many Moroccans, is not the modern equivalent of a punitive Harka expedition, a fiscal exaction of sorts; it is a policy instrument, that intervenes either to redistribute social surplus or to provide resources to public authorities so as to help what it perceives to be a potential new frontier. Both elements are designed within a political agenda, whose chief executive implements because they have a popular mandate for it. Agricultural taxation will help overcome its biggest problem: estate domains; because Agrarian Reform still has not gone out of style, the progressive policy seeks to clarify, to introduce transparency on who owns what, on how collective ownership is defined. Because as long as no proper and serious tax proposal is introduced, as long as the tax moratorium is decreed -until 2013, that is- only big, urban-dwellers, export-oriented wealthy farmers will benefit from the opaque estate regulations. The point made earlier on breaking up monopolies fully applies to Agriculture as well. Breaking the ceiling of Potential Growth: this topic is less obvious to policy-makers because it outlives their short political lifespan; it is about the general trend of education, research, finding ways to improve production and productivity, in short, the institutional elements fit to guarantee a solid base for growth and wealth creation. These are the issues where politics, the rule of law and economic, practical policies meet: the challenge to lay ahead is to produce adequate legislative framework to guarantee the rule of law and minimize administrative discretion over private ventures, to provide efficient and talented skilled workforce with good education and stable prospects, for both labour and business, and finally to find by ourselves, the perpetual ways to improve output and ensure growth does not do away. Do you remember that €1Bn eurobond borrowing the outgoing Finances Minister S. Mezouar had managed to land early September 2010? well, the yield has increased some 33% in just a little more than a year, thus placing the lower bracket to the effective future rate of borrowing abroad to a little less than 6%. and the pricing value is going down with little prospects for recovery. For a budget set on borrowing a lot more abroad to sustain its expenditure, this is a bit of a bad news: 6% is not daunting as a yield for the treasury to pay back, but it will certainly put a strain on public finances and mortgage the future. Regarding the bond itself, the yield is not going to change: 4.5% to be paid every October 5th all the way to 2020 and then set to pay back in fine the €1Bn initial borrowing. However, if the government needs to go back to Debt Capital Markets to issue additional bonds, they will certainly not get to issue them at 4.5%. And so far, these bonds need to yield a lot more to keep up: the 4.5% have been issued on a par value of 1000 for a €45 coupon; but because they have been issued at a discount – meaning, an investor need not pay the nominal value, but a little less, so as to make the bond more attractive- their yield to maturity should decrease as each day gets the bond issue closer to a payment date or its maturity. Sadly enough, this is not the case: the steep decrease in bond price up to the early 2011 was DCM beliefs that Morocco’s foreign debt sustainability was not strong enough to earn the 4.5% coupon rate. Supposing the next government decides at this very moment to issue another bond on international Debt Markets (DCM) they will have to provide investors with at least 6% yield- a penalty to be paid for because the present debt stock -foreign and domestic- is to high and most of bugdet expenditure goes into subsidies and pay-wage. Who’s fault is it? The context for foreign debt issuance needs to be recounted beforehand: the last time Morocco went on DCM was June 2007, where it has levied 500 Mln and is in the process of being paid, and in excellent terms for investors; meaning, the last time Morocco borrowed abroad, it has done so with a reasonable coupon, and the required yield remained in line with it. In other terms, the previous bond issue has been a success, so why not the next one? I do not believe the increase in required yield to maturity is the sole result of global economic downturn, or related to sovereign debt crisis. 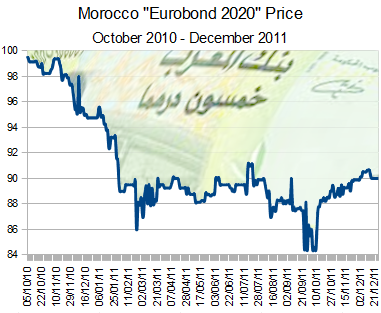 The yield to maturity on the Morocco “Eurobond 2017” issue has picked up very quickly and recovered from 2009, and from then on sustained a robust premium price above the nominal value. The fact that the Eurobond 2020 cannot replicate these performances and dropped its value in the early days of its issue is tale-telling: investors doubt the Moroccan government will put the money to good use, both to Morocco and to themselves. In that sense, those high officials at the Ministry of Finance (as well as outgoing minister Salaheddine Mezouar) have failed in providing value for money. I’d suggest this money has been squandered and could endanger not only Morocco’s freshly earned Investment Grade statuts, but the sustainability of its public finances. The coupon in itself certainly puts a strain: during the last couple of years, the treasury serviced MAD 2.1Bn in foreign debt and ceteris paribus, the 2020 Eurobond represents 74% of the average MAD 680Mln in paid interest since 2009. Though it is only 11.3% of all paid interest (foreign and domestic) the coupon drains a lot out of the country’s unstable foreign reserves, at times when they will be needed to sustain imports and the Dirham exchange rate. From 4.5% to 6%... in less than 1 year. 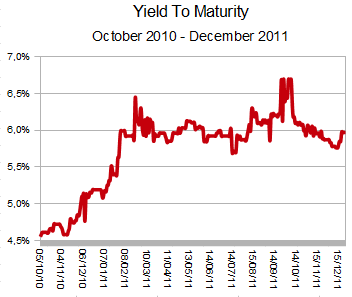 Discounted Bonds are supposed to have a decreasing yield to maturity, not the opposite. Government responsibility weights in heavily when it comes to the guarantees it was supposed to provide so as to insure value for money: what do we know of the expenditure the €1Bn was supposed to fund? Is it invested or just used to pay for compensation, pay-wage and other non-productive expenditure? Shouldn’t the Caisse de Dépôt et Gestion (CDG) sovereign fund be involved in managing the receipts? Will the next government find the money intact and invest it wisely? These are questions that will most certainly be left unanswered thanks to the institutional swamps of political irresponsibility and governmental weaknesses. In order to address these issues, the next government needs to assure investors they can deliver. The most straightforward policy to do so is to raise taxes. Relative to GDP, direct fiscal pressure for 2010 was only 8.73% and total fiscal pressure 19%. There will be a need for a more balanced approach to the fiscal distribution. Alternatively, but not exclusively so, the same policy will be needed to reduce expenditure. 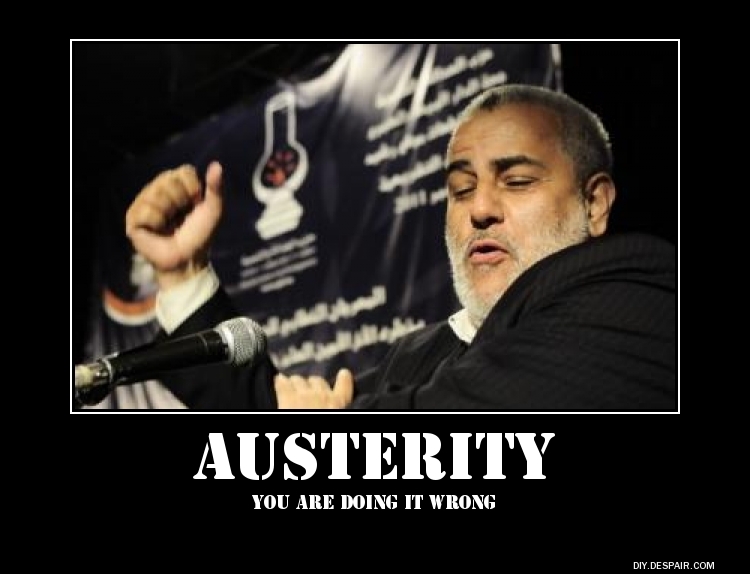 Given that the budget appropriation for the compensation fund has inflated over the last year, the much promised -but never implemented- reform of CdC will have to be carried on; the boil has to be lanced, either with unpopular measures to the average/median household, or with a vicious fighting with the establishment; a ‘caring’ government with a popular mandate is supposed to choose the latter. I am being only too pessimistic about it. Then again, I don’t have access to a Bloomberg or Reuters terminal to get all the facts. But from what I can see (and get) surely there is a lot of goodwill to prove on behalf of the Moroccan authorities to reassure investors about how serious they are in providing all resources and pay back the debt, because the best we can hope for -and afford- next time the Finances Ministry decides to borrow abroad is going to be 6%, and that is generous. the coupon is fixed with the issuance date. Prices and yields vary with respect to an array of variables, among others time and perceived risk; a higher perceived risk of default will lead investors to required a lower price -meaning, a lot less than the nominal 100 per bond, and thus increase the yield to maturity. – The Price of a Discounted Bond should increase over time: because it has been issued with a discount to investors, the bond price should theoretically converge to its par value; the 2020 Eurobond clearly does not converge to 100 – but rather to its Market-perceived true value, 90. The textbook explanation is that since the discount is only there to encourage investors to buy the issue, its true (nominal) value needs to be discovered along the time-line and after the first couple of coupons have been paid for. Fortunately however, the preliminary computations have not been useless, and provided a certain set of assumptions about household consumption in Morocco, crunched numbers can be of valuable teachings. The analogy with business cycles is quite important to understand the rest; broadly speaking, the initial, and perhaps the most important, assumption is that households, individuals and businesses, in their rational (or semi-rational) behaviour, tend to favour stability over random and extreme fluctuations. Stability means that everyone appreciates an increase in their consumption of goods, their wealth and their income. In that respect, a head of household would be more content with a steady job and steady prospects too. The same goes for a company in a mature sector, where market shares are very stable, and there is no point in going into a risky endeavour. Still, an economy like this will die away, because its growth will eventually stop at a certain point. This is why we need to introduce an additional element into the ‘black box’ of the national output: technological progress, a wonderful gift from heaven that translates into better consumption: the best example is that of a housewife with a washing machine (and I can assure the lady readers I am all for shared house-shores) with a completely changed pattern of consumption, with more abundant and better quality goods. 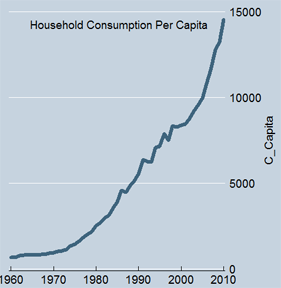 And there lies the first caveat: consumption as depicted in the graph does not account for the increased quality in edible and durable food, the efficiency in electricity consumption, and the rise of the internet, among others. The expressed value merges all of these things into one big aggregate indicator. However, as we are more interested in how consumption as a whole evolves across time, this does not matter a lot. and evolve it did: the average annual increase in consumption per capita has been 0.8%, a 50% increase since 1960 – by comparison, GDP per capita doubled over the same period of time. Even though wealth has considerably increased in Morocco, consumption remained relatively stable: it increased 40% over the last 50 years, but GDP increased almost three times more. It is also worth noting that GDP and Consumption display a strong correlation in terms of growth rate. indeed, one can even think of some sort of dynamic interaction between value creation and household consumption, a pull/lag of sorts, even more so obvious given the consumption-based GDP aggregate; in this sense, household consumption contributes to growth basis points. We are however interested in a different topic, namely how well households try to smooth over their consumption across time – regardless of changes in their standards of living. The purpose does have some policy implications: an income tax cut is bound to generate some additional domestic consumption, but by how much and how long is unknown, unless elements such as smoothing consumption across time, with the clear implication that an increase in income not only is conditioned with the immediate marginal propensity of consumption and the smoothing effect for future use of income. Also, there is evidence (later on discussed in detail) on lagging effects -autocorrelation- that go has far as 10 years-time on, perhaps the best evidence that past decisions are factored in over a longer than expected period of time. 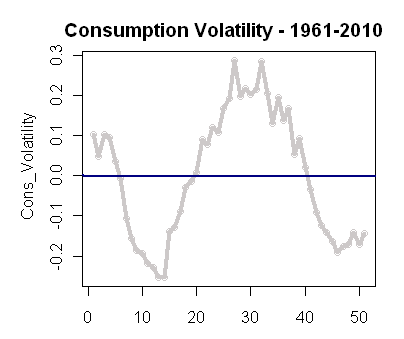 The assumption of a perfectly smooth consumption pattern goes right out of the window with the distribution observed, although there is very little to be said about it starting from the 1990s: the trend is steadily decreasing, though it has modestly picked up pace in the late 2000s. Now, results show that household consumption is a lot less deterministic than I or anyone else would think it to be so. Does it make sense? In a sense, it does. First because households do not necessarily control their outside environment, and exogenous shocks -from productivity and other factors- are more of a random nature than anything else. It is thus understood that past decisions affect present and future ones, and the unaccounted for elements are also lagging over the years. Truth is, the most persistent pattern starting from “modern” Moroccan economics – modern in the sense of the Adjustment Structural Program aftermath- is a steady decrease in consumption relative to the very long term consumption trend. It is both concerning and interesting: first, it seems as though there is no “trend” to speak of: the trend does exist, but it is only a statistical happening, that there is no collective understanding of the concept. This looks even more alluring that the deviation from the trend is very large, and is very sensitive to brusque historical events: the early 1990s reach a peak because PAS was about to stop, but from then on, there is a steady decrease from the theoretical trend (that coincided with a stiff recession at the time) a very fast deviation from the trend that seems to mimic that of the late 1960s and early 1970s. There is however a very persistent regularity in these cycles that allow for other means to pursue: there are methods to verify and even predict the next changes in consumption patterns, and these will by the same means produce results on how households will adapt their consumption relative to the trend. This post is a broad introduction to a more ambitious project seeking a more formal approach to consumption patterns in Morocco – because these are going to be the cornerstone to a host of policies related to taxation, foreign trade, food and edible goods domestic productions, to name but a few. A few days back in Morocco are quite short to spend with one’s family and acquaintances – but hey, I suppose it’s great to be back anyway, even for a short time. A few things to discuss perhaps (given a very busy schedule and burdensome workload inherited from the Fall semester, among others) that do not relate strictly to the main topics this blog usual posts about. Or perhaps it does: Parti Socialiste Unifié is organizing this weekend their convention, and well… I am very ambivalent about it all. At no time during the opening day was there any feeling that perhaps the strategic choice of backing up Feb20 all the way up (or down) instead of taking a step back and consider the bigger picture: PSU is there for a long time, the movement, clearly not. More on that, later. I have also taken to watch some new TV shows as well – namely, Hart Of Dixie (yes, I know…) Boardwalk Empire and Pan Am (Yes, I know!) and believe you me, they are worth watching, really! Hart Of Dixie was not my idea; I started listening to some Otis Taylor tracks (Ten Million Slaves is easily recognizable for those who enjoyed watching Public Enemies) and the trailer was interesting enough: a glossy, too-good-to-be-true freshly graduated New Yorker Doctor Zoe Hart (Rachel Bislon) finds out that her real father is one Harley Wilkes, a Doctor in Blue Bells, Alabama, in the heart of Dixieland. Hart needs to spend a year South of the Mason-Dixon line before she can move on with her future career as a cardio-thoracic surgeon. The show is enjoyable, it really is ! Boardwalk Empire is of another calibre however; but then again, that’s Martin Scorcese for you (he direct the Pilot). The show is set in Atlantic City N.J. during the 1920s, at the height of the Prohibition Era. A special effort has been made for the costumes, the music, the hardware… and I don’t think words are enough to describe all the back-room politics that take place in Atlantic City. Enoch ‘Nucky’ Thompson, city treasurer and the mastermind of a large-scale bootlegging scheme that doubles as an efficient political machine (E. Thompson fits in the American political vernacular of local “party boss”) running on buying off loyalties and other allegiances to, say, get the New Jersey delegates behind Warren Harding‘s nomination for GOP presidential candidate. Great stuff to watch, already two seasons have been aired so far. Last series is Pan Am, I’m still watching the earlier episodes, but it sure has a je-ne-sais-quoi flavour of Mad Men: both are set in the late 1950s- early 1960s, and gender relations are depicted with a great deal of realism. 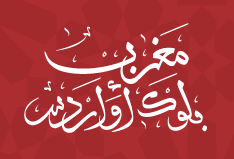 But enough with the glamour: PSU is holding its convention this weekend, between Bouznika and Rabat, and from what I have read and listened to, and for all the goodwill displayed and the hopes aroused, we are still far away from building a strong left coalition. Why so? Because party leadership – outgoing and even the likely new- still do not understand that shackling the party to Feb20 with so much enthusiasm and with little strategy, even to influence Feb20 and induce them to be more amenable to our goals, is not a strategy, it’s standing on the sideways of political history. Don’t get me wrong: I think the party belongs with the Feb20 movement, but let us face it: left-wing political parties and radical Islamist AWI are all competing for influence -not control- of an otherwise very heterogeneous organization (although the term “organization” is a bit of a stretch) and I blame the movement for making PSU leadership going gaga over the youth; I really do. Because of them, the decision to boycott elections and the referendum has been of no sizeable political benefit in terms of party membership or standing among the mainstream Moroccan citizens. And instead of going for the issues that matter, taxes, jobs, crime, standards of living, education and local government, I was horrified to listen to some of the speeches given during the opening meeting for the convention, and two words kept coming back: “Nidal” & “Somoud“. Get over it, those we seek to enrol in our grand scheme for social justice and democratic institutions are not interested in militant mumbo-jumbo, they want clear and detailed answers to well-defined and real problems.The only thing I find solace in is the unheard of -in Morocco- transparency by which the party runs its internal elections: deliberations are open for independent observers, and party finances are there for everyone to see. No other party -save perhaps for PJD- can and does so. Occasions like these reassure me in my political choices. I did not attend the rest of party conference for many reasons, among which some urgent projects I had to hand out on a tight schedule, the fact that I have not seen my family in months, and finally because my small, temperate, reasoned voice has no chance to be heard. 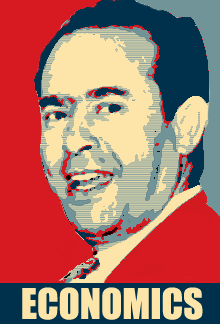 I hope the newly elected leadership will heed the call of moderations in words – something that does not surrender the party’s nihilism, and does certainly not mean that they have sold out to Makhzen apparatus, because it is high time we left-wingers had crossed over to the Moroccan electorate to get them interested in our scheme, and left behind an obsolete body of language. The argument about the nefarious effect of too concentrated an income in a particular country can always be made to gainsay any potential benefits to the trickle-down -or supply side- economics: while it is almost impossible -and probably counterproductive to enforce or allow for perfect, egalitarian distribution of income and wealth, evidence can buttress the case for a wide median/middle class, empowered with a large income share, and comforted in a steady and balanced growth in its wealth. 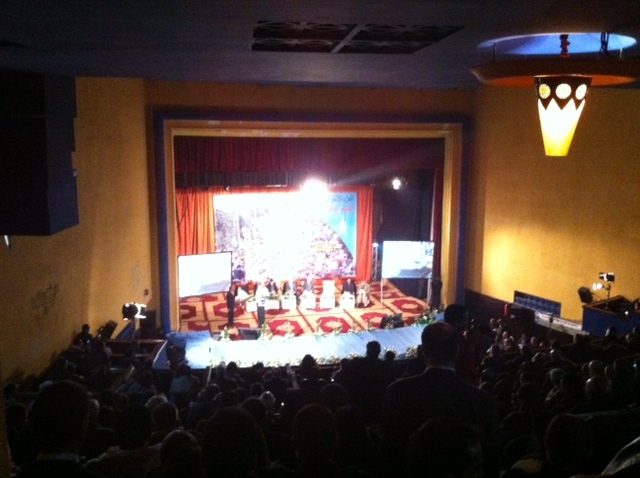 From a policy point of view, I believe the wages and income issues are perhaps the only thing that can bring together large scores of Moroccan populations whose cultural and political loyalties are too polarized, but eventually find solace in pledges to improve their standards of living, and would even go as far as support that political organization credible enough to reduce inequalities and guarantee steady income growth for all. Gross national income is derived as the sum of GNP and the terms of trade adjustment. Data are in constant local currency. Clearly there are some components one isn’t very interested in; the figure of interest should be purely domestic – we are, after all, interested in domestic income. 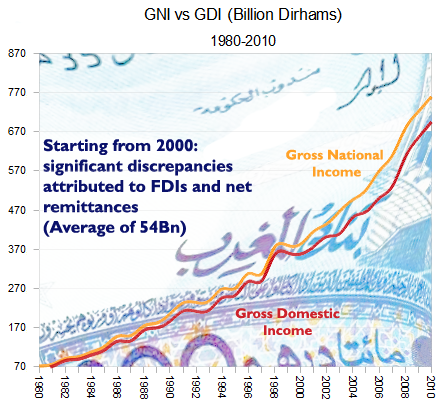 Because GNI is basically the sum of domestic income and primary income from abroad, we can therefore compute it with net foreign income from FDIs, Workers’ remittances and portfolio inflows. But still, even with these rule-of-thumb, back-of-the-envelope computations, final results are not as bad as one may make out; quite the opposite, they seem to be quite close to whatever comes up in official reports. Still and all, it is always good exercise to investigate whatever figures of interest. 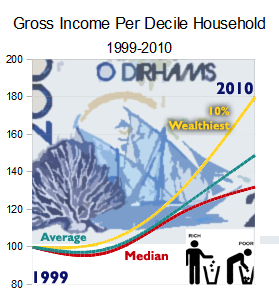 Now, rearranged figures show that domestic income distribution per deciles and quantiles are on the low side when compared to GNI breakdown – which is only logical, given the computed differences in FDI and remittances – nonetheless, one finds out that upper 20% and 10% within still benefit from a high annual income: for the wealthiest 10%, it was MAD 222,000 per annum in 1999, it neared 400,000 in 2010 – while average domestic income was MAD 71,000 in 1999, it increased to MAD 106,000 in 2010. It is clear that the average annual increase was higher for the richest 10% (+5.47%) than the observed average (3.7%) and that applies only to domestic income. As for median income, an annual increase of 2.5% was recorded over the considered 12-years time period, growing from 53,000 to 70,000 per annum, and in constant terms; the conjugated effects of a base 1999 inflation (CPI) and the downgrade in income distribution to the expenses of median households vindicates the claim made in an earlier post that median households have lost purchasing power to monetary illusion. during the considered 12 years, CPI inflation (base year 1999 instead of HCP’s ICV base year 2006) was at annual average of 3.4%, in addition to the annual 1.14% dent in median income share, this means a real discount of 4.54% on any nominal income increase; it stems from the number computed earlier on (2.5%) that there was significant loss to real purchasing power to this class of households – relatively higher, when compared to a GNI-based computations, and this only makes sense: foreign currency inflows are not subject to the same inflationary distortions, and so, tend to make up partially for the purchasing power downgrade, across the board. +80% of top 10% and +50% for the average - over 12 years. But the bottom line of the argument made earlier is vindicated by these findings: middle class are hurt in their income, and this comes to a blow, because a balanced society with low risks for social unrest needs a strong and wide middle class base – if this is observable in a host of country, there is good reason to believe that it would apply equally to Morocco as well. But let is now consider something different, less dynamic – the present distribution of income as it were. 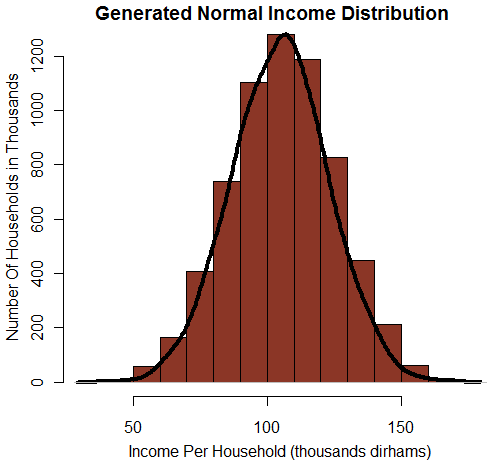 In statistics, probability distribution are quite useful to assess, in this case, wealth distribution across households – we start from the purest egalitarian distribution of all, the uniform distribution. Uniform/Egalitarian: very easy a computation, just take every household, number them from 1 to 6.5156.000 (approximately) and then allocate them with the same income, namely GNI per household. Median, Average and Variance are clearly defined and everything is fine. This how an egalitarian society would look like: all households deciles would have the same income, i.e. 106,000 per annum with uniform growth per household from 1999 and 2010. The only snag is that it is utopian and almost impossible to enforce. Plus there are no immediate economic benefits to such a distribution: can we expect growth if everyone is insured to have the same income as the others regardless of their contribution to society? But then again, that would be too good to be true – though it is realistically more achievable, and the case for a strong and wide middle class can then be made more forcefully. 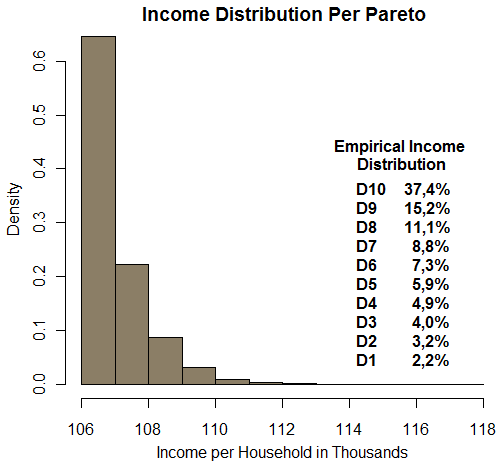 Pareto Distribution:and this is the last distribution one should have a look at, because as far as available empirical data goes, this is the closest we can get to the real income distribution in Morocco. And it all adds up: as we observe average income per households is 106,000, there are 30% households above that line capturing 60% of total Domestic Income. We compare and confirm that incomes in Morocco follow very closely a Pareto-like distribution, which denotes of its unequal distribution indeed. Finally, it is enough to look at the Gini index to understand why the Pareto-shaped distribution in Morocco is so unequal: HCP’s own computations put the Gini Index at 0.46, certainly one of the highest in the world. According to the United States 2008 Census, their 2009 income Gini Index was around 0.469 – very close to Morocco’s. What does this tell about our own economy? I would suggest that we have achieved the same level of income concentration as the United States’, but ultimately failed to raise standards of living for the middle and median classes, not even commensurate to the selected benchmark’s own growth over 1999-2010. # Min. 1st Qu. Median    Mean 3rd Qu. Max.